In a previous post, Why find your Trek America buddies before your tour? 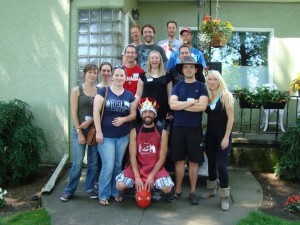 I shared tips on some of the benefits to meeting your Trek buddies online before you travel. In this post, I’ll explain how to find your Trek America buddies in 5 easy steps. Trek America are very open about providing trekkers with some basic details about the tour group (you can find out how many people are booked, get an overview of the age range, nationalities, gender ratio and numbers of people travelling solo or in pairs etc). I’ve travelled with other small group adventure travel companies and some have refused to give any indiction, which isn’t always very helpful. A company needs to be mindful of protecting customer data, but it’s still possible to do that and be helpful. So although, asking Trek America directly won’t result in finding your trek buddies, the information they provide will give you a heads-up on who you are looking for. If you are not already registered with Trek America Live, head on over there are and create an account. Once you’ve created your account and profile, you will see a box at the bottom left of your profile where you can enter the details of your next trek and join your virtual tour group. Trek America will check you are actually booked on the tour and around six weeks before your tour begins, Trek will make the group available and you will be able to access it from your profile and meet anyone else in your group who has also chosen to join the virtual tour group. Visit the help section of Trek America Live, if you need more guidance. Note, this is the safest way to find your trek buddies online in advance of your tour because each group member is verified before being able to access the group. Trek America Live also has a discussion area on the site, called Live Forum and there’s a forum for each trek in the “Meet your Trekkers” area, so you can post there too. If there isn’t already a new discussion relating to your tour date, start in new one with the subject line for your message as the tour start date, so anyone else joining that particular tour at that time can easily see. Trek America have an official Facebook page: Join Team Trek America If you haven’t already liked their page, this is a great place to find other trekkers (by posting details of your tour and a link to your Facebook group – see below) and get advice from the trek community. You won’t find your Trek America buddies overnight, it takes time. So be patient and if it really matters to you, be persistent. Post in the Trek Live forum at least once and check once in a while to see if someone missed your post and started one of their own discussions. Regularly check the posts on Trek America’s Facebook page and post details of your tour date. Facebook notifications aren’t always reliable, so don’t rely on them. One of your fellow trekkers might send you a private message, so keep an eye on your Facebook messages; messages from people you are not connected to, go in the “other” folder rather than your “inbox”. I have never had any problems in following the above approach to find people I’m going to be travelling with but that doesn’t mean that something can’t ever go wrong. Always be comfortable with what you are sharing publicly online and even if someone claims they are going to be travelling with you on the same tour, remember you do not know them and the only way to verify this, is if you all join your virtual tour group on Trek America Live. If you choose to use a private Facebook group, only share your mobile phone number if you are happy to do so. The same goes for adding potential trek buddies you have never met as a friend on Facebook; you might want to limit the information they have access to until you get to know them better or you might decide you only add people as friends once you have met them. That is entirely up to you and you should never feel awkward about that, or take offence if someone declines your friendship request; it’s good to be careful about who you connect with. Learn more about Facebook privacy in the Facebook Help Center. Finding most of my trek buddies in advance has just added to the experience (the planning is half the fun, right?) and enabled some friendships to develop quickly. Plus it has helped those who are travelling solo for the first time. If you missed the first post in this two-part series, take a look at some of the reasons why it can be great to find your trek buddies in advance. How do you find your trek buddies? The above are just a few ways which can increase your chances of helping you find your Trek America buddies online in advance of your tour. Some trekkers also try using Twitter and other social sites, but you are likely to have more luck if you concentrate your efforts where Trek America has a big following, like Facebook.If you have any other suggestions, please share them in the comments, below.